Chamilo is a free e-learning and collaboration software which aims to improve the access to education on a global level. In this tutorial, we will show you how to install Chamilo on a Linux VPS running Debian 9 as an operating system. If some of the software required for Chamilo to work is not installed or enabled on the server you can follow the steps below to install it. Of course, you need to replace YoUrPaSsWoRd with a strong password of your choice. php --ini | grep "Loaded Configuration File"
Save the changes you have made in the php.ini and restart Apache again. The next step is to download and install Chamilo on your Debian VPS. Download the latest version of Chamilo from the official Chamilo download page. At the moment of writing, the latest version is 1.11.8 which works well with PHP 7.0.x or later. Follow the installation process to complete the setup. It is OK to accept all default values. You should also consider changing the admin password so you can easily remember it. 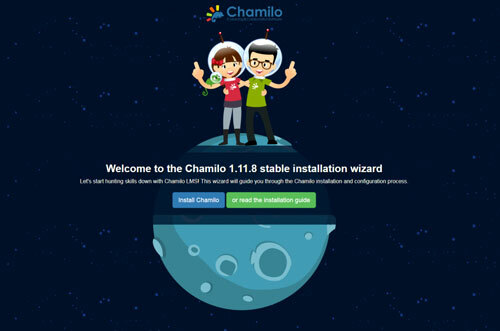 Once you are done with the installation of Chamilo on your server, you can refer to the official Chamilo documentation for more instructions on how to use and customize the software. Of course, you don’t have to install Chamilo on Debian 9, if you use one of our Debian Cloud VPS Hosting services, in which case you can simply ask our expert Linux admins to install Chamilo on Debian 9 for you. They are available 24×7 and will take care of your request immediately. PS. If you liked this post on how to install Chamilo on Debian 9, please share it with your friends on the social networks using the buttons on the left or simply leave a reply below. Thanks.